Ami Shavit - Yom Kippur 1973. Vinyl LP. Bleep. 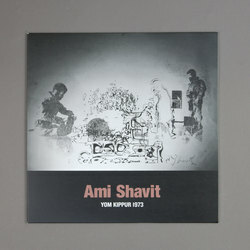 Ami Shavit was largely a visual or mixed-media artist, but the Israeli occasionally made forays into the world of experimental music. His final sound work, Yom Kippur 1973, is also one of his most important. Shavit made music by which people could meditate, but this record was intended to allow soldiers who fought in the Yom Kippur War (also known as the Ramadan/October/Arab-Israeli War) a means by which they could begin to process their trauma. The three pieces on this LP are characterised by the juxtaposition of stormy synthetic textures and arresting keyboard lines. In a way it prefigures much New Age and ambient music, but really Yom Kippur 1973 is far too potent a listen to be described as either.